If you are searching for one of the best backup plugins WordPress Site, WPVivid is the name that can make it easy for you. It is an excellent free backup plugin that offers exceptional ease of use and configures to the users. One beautiful thing that I would like to admire here is the freedom of selecting as much as of cloud storage as I want. You do not need to configure backup manually, it gets automatically done when you did with the WPVivid on your device. Moreover, you can also restore your website with one click ease by using the related function if something goes wrong with your site. 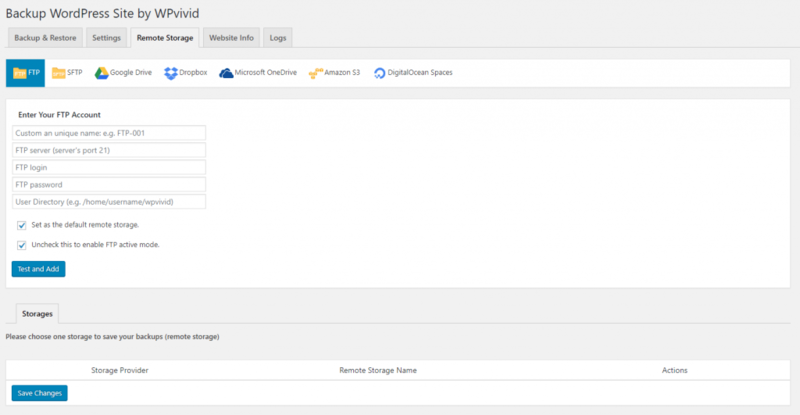 WPVivid is the best WordPress Backup plugin for your WordPress website that enables you to perform manual and schedule backups, cloud storage, and restoring backups directly from your WordPress website to the admin dashboard. Please find below the list of WPVivid Plugins’ significant features. You don’t need to worry about the back up your website manually, once you have installed the plugin in your device, it will do the rest automatically. This plugin is one click restore process from a backup where you only need to make a single click to get your deleted data back. You don’t need to purchase any free cloud backup there, as the tool will take care of that also. Wherever will be your data in the cloud storage is located whether it is in Dropbox, Google Drive, Microsoft OneDrive, Amazon S3, DigitalOcean, Spaces, or various others. You can now quickly filter your backup files and especially the larger ones as well. You don’t need to worry about the limit o the backup size here. The design of this nice backup plugin is very responsive that makes it very easy for everyone to use it. 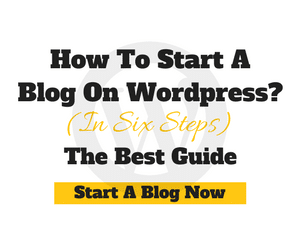 You can quickly optimize this website for any of the hosts without having any issues. You are supposed to get instant email reports on each update. The plugin also offers you the facility of downloading the required backup files. WPVivid offers users the facility of viewing live progress of your backup process. You can even lock your backup to keep it safe from unwanted access or auto-deletion. You are free to rename any of your local backup directories without having any issues. 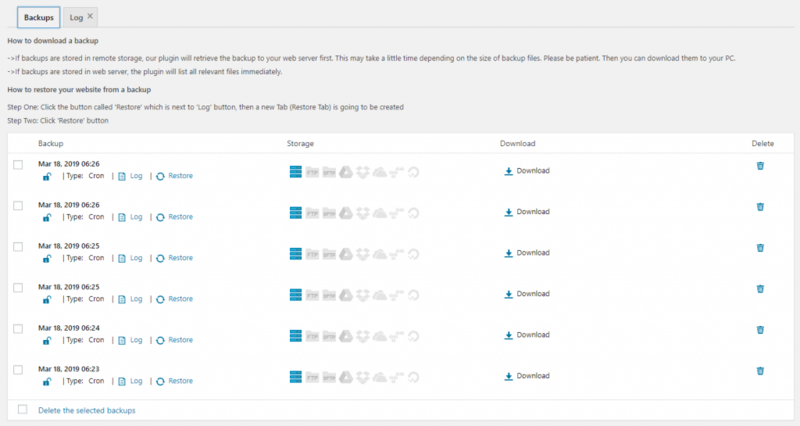 How to Install and Configure Backup WordPress Site by WPVivid plugin? You can install the WPvivid plugin from the WordPress Dashboard or Plugin Directory. WPVivid Plugin will be categorized under five different tabs. They are Backup & Restore, Settings, Remote Storage, Website Information, and Logs. Please refer the below screenshot for your reference. Backup & Restore allows you to manually backup your website. You can choose what type of backup you would like to prefer. The different kinds of backups are Only Database, All the existing files excluding Database, and Entire website (including existing data and Database). You can also save your backup to any remote storage location or your local computer. You can lock the manual backup by enabling the option “Backup can be deleted manually.” Once the backup is created, you can do the following actions: Restore Backup, Delete, Download, and Lock. You can find multiple settings for your Backup. They are Enable Backup schedule, Clean Junk files, Compress your existing files to XML, Remove old backups, change or rename the backup folder name, Archive your backups. Normally, your backup will be named as wpvividbackups (which is a Default name). But you can easily change your backup name under your local directory. You can also delete the old or outdated backups from both Remote and local directories. To ensure whether the plugin is working properly, you can make use of your Gmail account (Google account) as Remote Backup service. Under the Backup & Restore tab, please click on “Blue Backup now” and select “Send backup to remote storage” option to save your backup. You can check the total file size to confirm the backup. 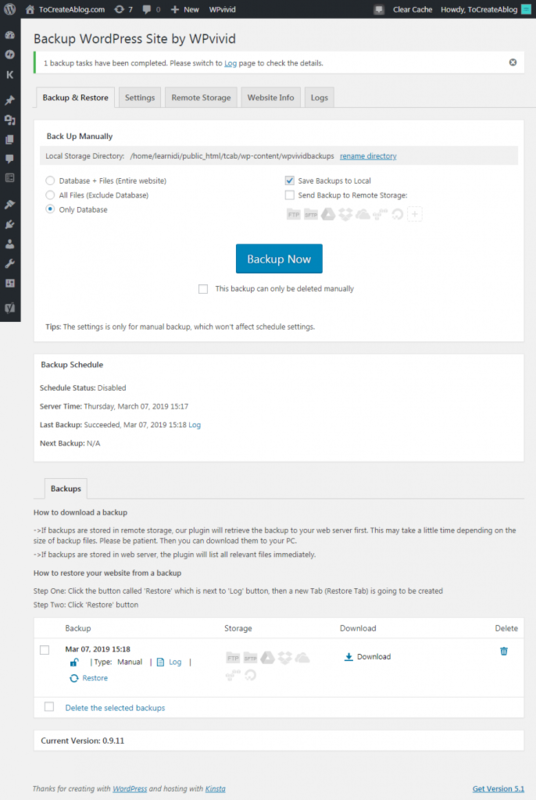 After confirmation, you can delete or download the backup from your WordPress dashboard. 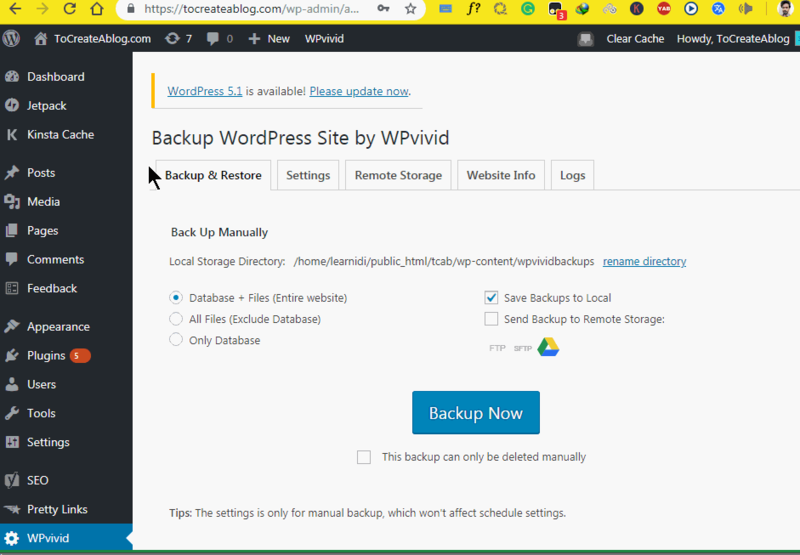 Why You need Backup WordPress by WPVivid plugin? If you don’t have an In-built backup system then you are going to lose your valuable information at any cost of time. 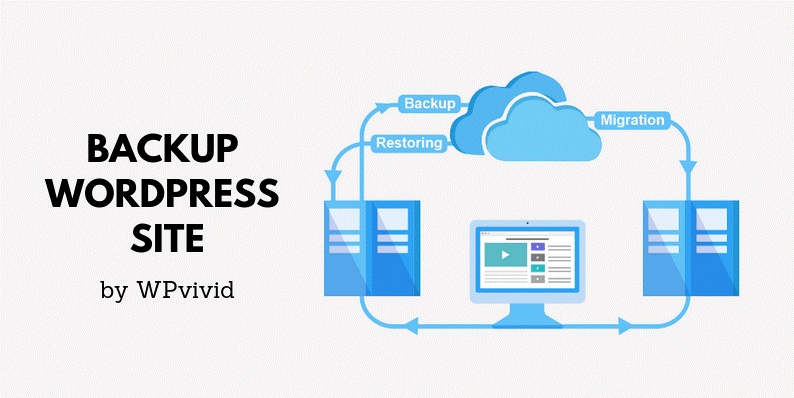 You can make use of Back up WordPress by WPVivid plugin to restore or backup with a single click. Your regular scheduled automated or manual backups will prevent your website’s data loss. Since many of them are using an open source platform for your website. They can easily make use of your website’s source code. The Backup WordPress by WPVivid plugin will protect your source code by disabling the copy option of your source code, so users may only able to view your source code and restricted from copying them. 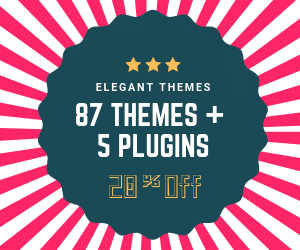 Many plugins do not provide multiple options while backing up your website data. It is possible only to take the entire website backup, but to use in different formats is appreciable, and that is where we need WPVivid most. This backup plugin is being designed to provide you the opportunity of selecting what type of backup would like to perform. You can either take backup only for your database or with including files or can choose upon the same for the entire website. Also, your backup size can be maximum of up to 2GB file size. I appreciate this backup plugin option as it is offering you more storage space now for backing up your unlimited data. 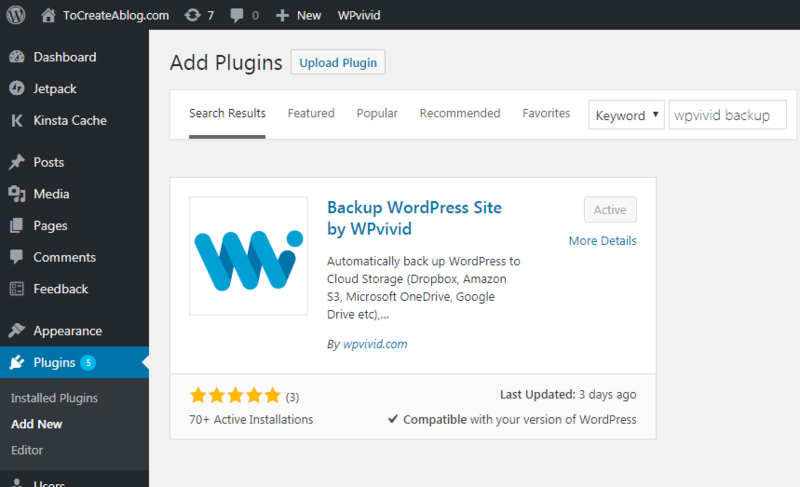 Please find below the lists of the importance and benefits of using Backup WordPress by WPVivid plugin. Using the Backup WordPress by WPVivid plugin, you can easily configure the size limit for every file. Your file will not be backed up only if it exceeds the set size limit. You can easily create a backup for your device whether it is manual or automated depending upon your host limit. This fantastic backup plugin is being designed to offer you unlimited storage size options, especially for your backup tasks. Isn’t it amazing? It is only the hosting account size or the cloud storage sizes that can fell shorten of space, but surely not your plugin back up is. Moreover, this fantastic tool also offers you the opportunity of creating several backups to your device on a designated server without having any issues. 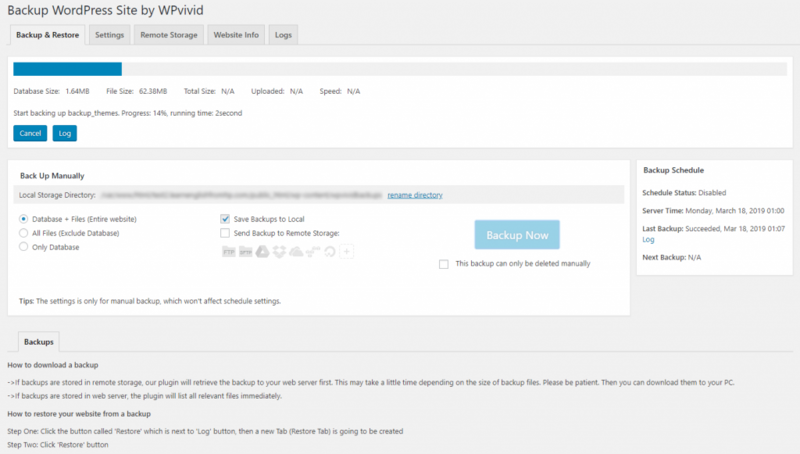 The salient features of using Backup WordPress by WPVivid plugin are configuring scheduled automated or manual backups. You can take multiple backups depending upon your requirements. The backups can be taken at specific intervals like Monthly, Bi-weekly, Weekly, Daily or even for every 12 hours of time. You will also receive an email alert with the status after the completion of your backup. Moreover, it is very easy to store the backups to your local hard drive (computer). You can easily download a copy of your backup from the Cloud storage or your web server. The Graphical user interface of Backup WordPress by WPVivid plugin is designed to be very interactitve and responsive for all sorts of devices. It is much easier to work even on your computers, tablets, or mobile phones. WPVivid backup plugin create or restore your backup either on your local computer or web server or even from cloud storage by using a single click. Your database size will be at a maximum of 2GB including files and data. You are provided with more options to choose what type of backup would you like to perform. You can even take the backup for the database alone or with including files or for your entire website. Usage of log files plays a vital role while using Backup WordPress by WPVivid plugin. All the activities that are performed during the backup and restore process will be tracked and saved under your log files. In case if you experience any issues then you can make use of the log files to start with your troubleshooting steps or even you can forward the log files to the technical support for their investigation and assistance. Also, it is very easy to clean up the junk or temporary files which are created during the restore or backup process. I am happy to inform that the above-provided information will help you to understand more about Backup WordPress by WPVivid plugin and its benefits, also problems you face without the usage of Backup plugins. You can refer the provided screenshots to get clarification about the plugin features and its installation steps.